Shot Comparison Tool. 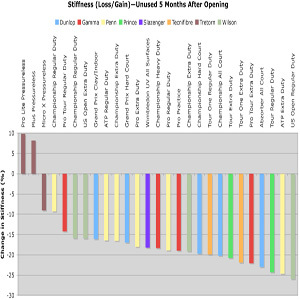 Comparison of trajectories by changing racquets, swing speeds, swing angles, and more. 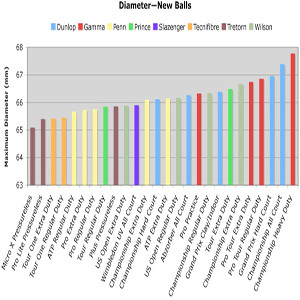 Various ball types are designed differently, manufactured differently, and perform differently. 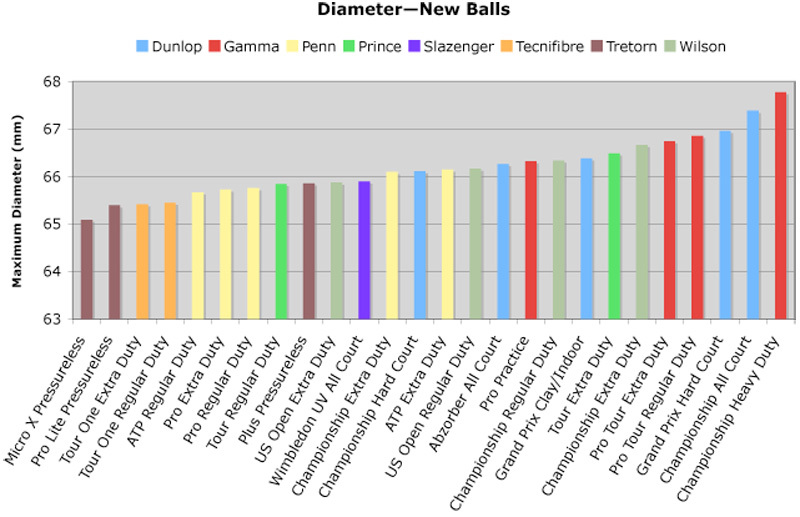 We set out to measure these differences using 26 different kinds of balls from eight manufacturers. We tested only one can from each manufacturer. Was that can representative of all cans? Who knows? Would balls from 100 cans test the same relative to each other? Again, who knows? Were some balls fresh from the factory and others months old? What we do know is that our sample was probably just as good as any player's "sample" when he goes to the store. Chances are that we got an average slice of reality, but we warn against making any absolute generalizations about specific ball types based on this limited data. 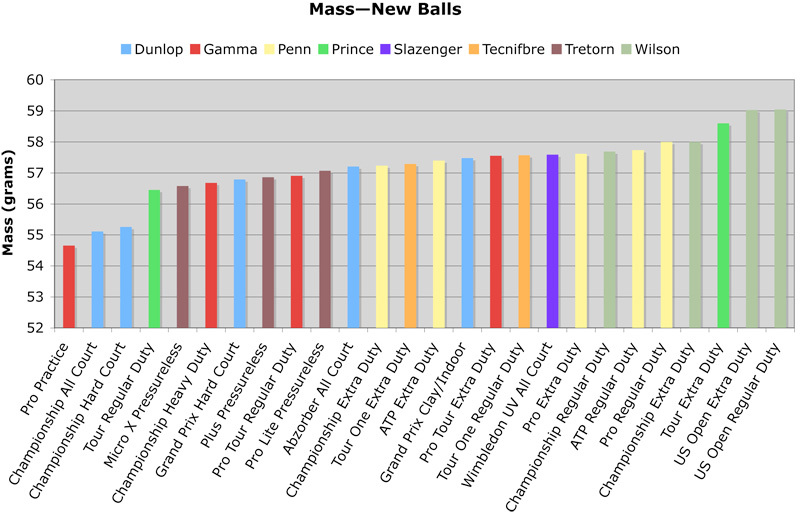 What you can take away from the data is generalizations about balls in general. And these are interesting indeed. Together, these properties will determine how the ball bounces and feels on your racquet. We performed the ITF tests plus a durability test. After the durability test we put the used balls through the same tests again. 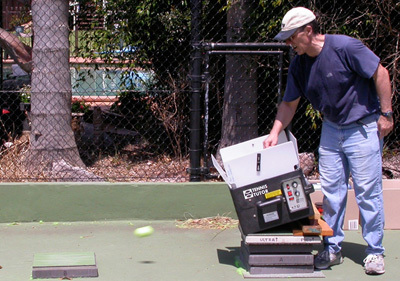 The durability test involved firing each ball 30 times at high speed and oblique angle onto a cutout slab of hardcourt. The ball hit the fence and was returned to the ball machine via one bounce on the tennis court. In this way we were able to measure new and used ball mass, diameter, bounce, and deformation. One caveat is necessary. Although we performed all the ITF tests, they were not performed at the required temperature of 68 F. An air conditioning glitch necessitated that tests were performed at 73 F. So the tests were not valid “pass/fail” tests but they were accurate indications of the difference between balls. In any case, balls bounce alot higher on a hot day than they do on a cold day, so a complete performance test should really be done at several different temperatures. 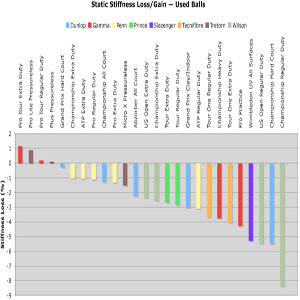 Due to time constraints, we did complete “used-ball” tests on only one ball from each can. We did “new-ball” on all three balls from each can. The range of all masses was between 54.66-59.04 grams. Three balls were below ITF specifications. 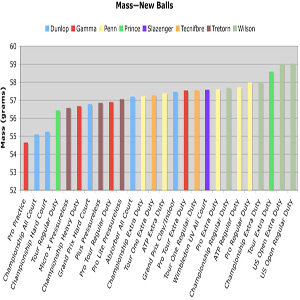 The average mass of all 3 balls per can ranged from 55.25-58.90 grams. The weight variance for all three balls within a can ranged from .04-.58 grams. After durability testing, balls lost between .34 and .94 grams. 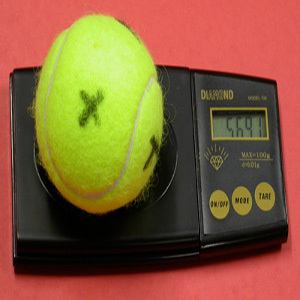 Figure 1 shows a ball next to .22 grams of fuzz. Some balls lost 4-5 times that much fuzz! Figure 1 — Ball mass. 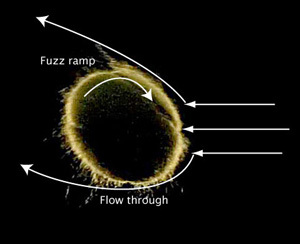 Figure 2 — Ball fuzz lost. 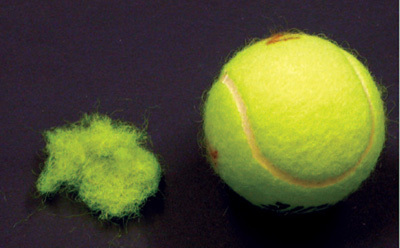 Figure 3 — Ball mass comparison. 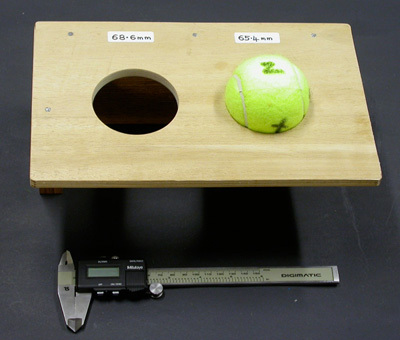 Figure 4 — Ball diameter measurement. Diameter variance within a can for all 3 balls ranged from 0.01-1.27 mm. Figure 5 — Diameter comparison. 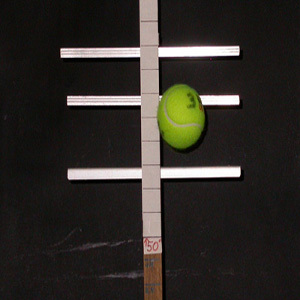 Diameter is measured after balls have been compressed three times on three axes. 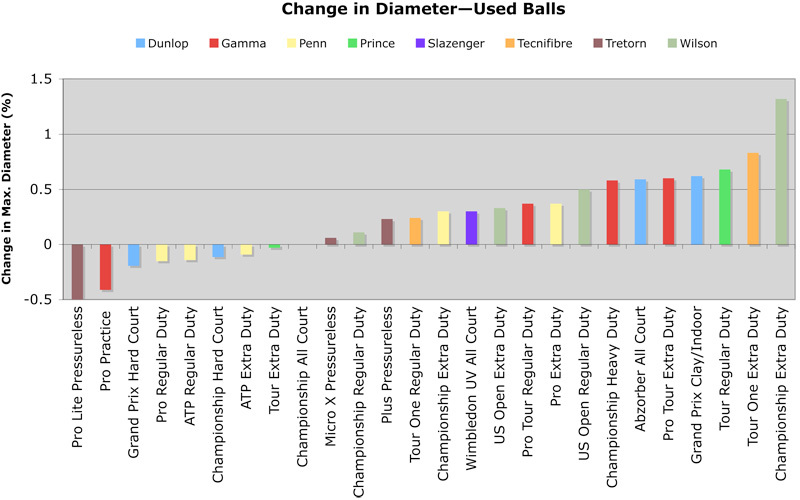 All balls complied with the ITF diameter specifications. Figure 6 — Diameter change. 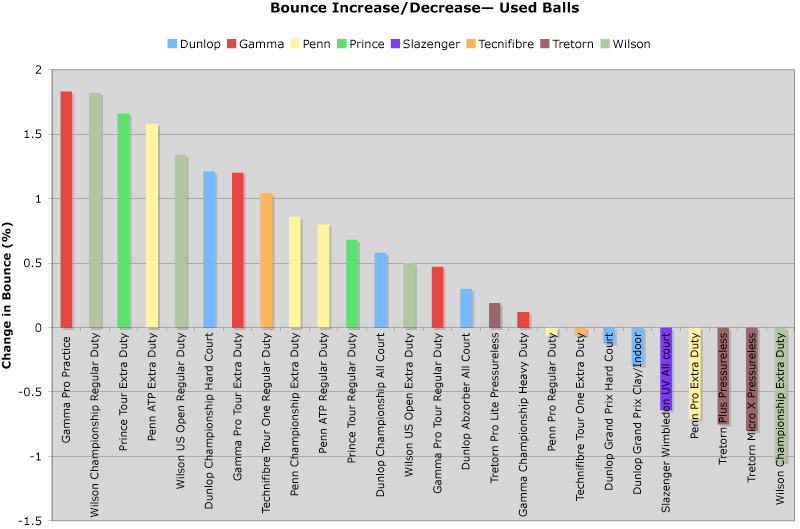 Balls change shape very slightly when they are hit or bounce very hard. One hit might round out a ball or flatten it in the same direction in which it is already asymmetrical. So the ball on the far right might be on the far left next time we measure the same balls. The lesson of the graph is to show the range in which this change of shape can happen. Under our test conditions of 73 degrees, balls dropped from 100 inches onto a granite surface bounced between 52.93 and 58.43 inches (Figure 7). The ITF requirements are for a bounce between 53 and 58 inches at 69 degrees. 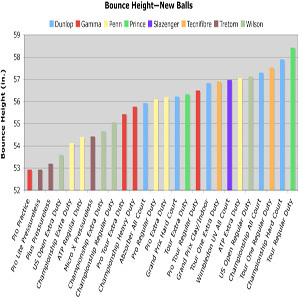 Figure 7 — Bounce height test. 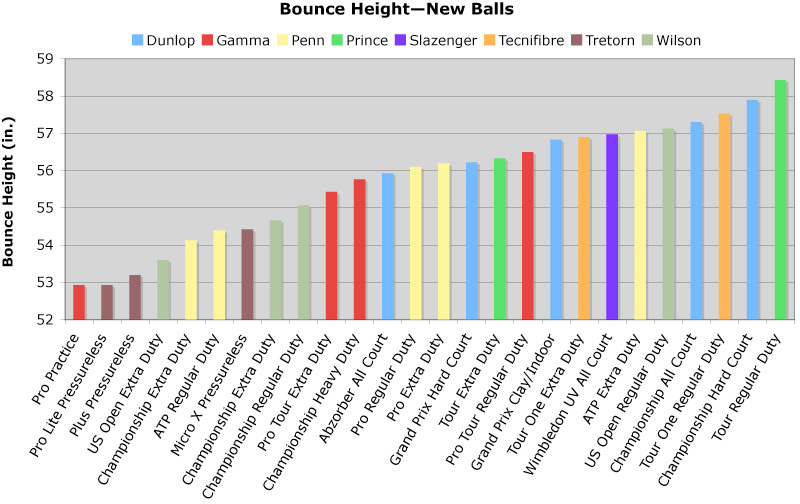 Figure 8 — Bounce height comparison for new balls. 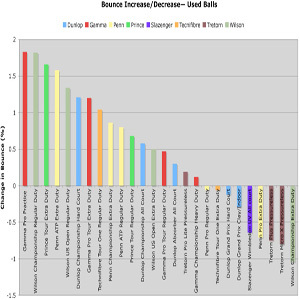 Figure 9 — Bounce height change for used balls. Standard ITF deformation (i.e., compression) tests were performed on all new balls (Figure 10). This involved (1) compressing each ball 3 times by one inch along all 3 axes to make sure the ball was round before testing it (2) compressing the ball with a load of 18 lb to measure the “forward deformation,” (3) increasing the load until the ball compressed one inch and (4) decreasing the load back to 18 lb to measure the “return deformation.” These steps were repeated for all three axes and the averages of each measurement were calculated. Figure 10 — Stiffness test. These are static (not dynamic) stiffness tests. Consequently, it does not necessarily follow that a statically measured softer or stiffer ball will also be relatively softer or stiffer on racquet impact or that it will bounce higher or lower when it bounces off the court. In some respects, step (3) is more important than steps (2) or (4). 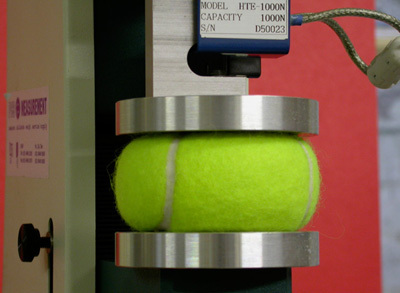 Surprisingly, there is no ITF rule about the force required to compress a ball by one inch. 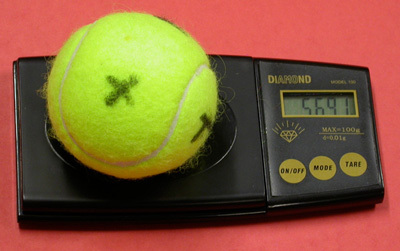 A ball hit firmly compresses by around one inch. The compressions at steps (2) and (4) are only about 0.25 to 0.4 inch, which is about the same compression as a player achieves by squeezing the ball by hand. The ITF legislated “forward/return” deformation data is meaningless to most people, so we converted it to a simple stiffness calculation in terms of pounds necessary to compress the ball one inch (Figure 11). 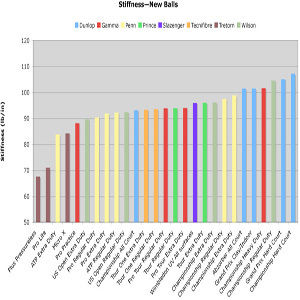 Stiffness variance within a can for all 3 balls ranged from 0-10.53 lb/in with an average variance for all balls and brands of 2.63 lb/in. 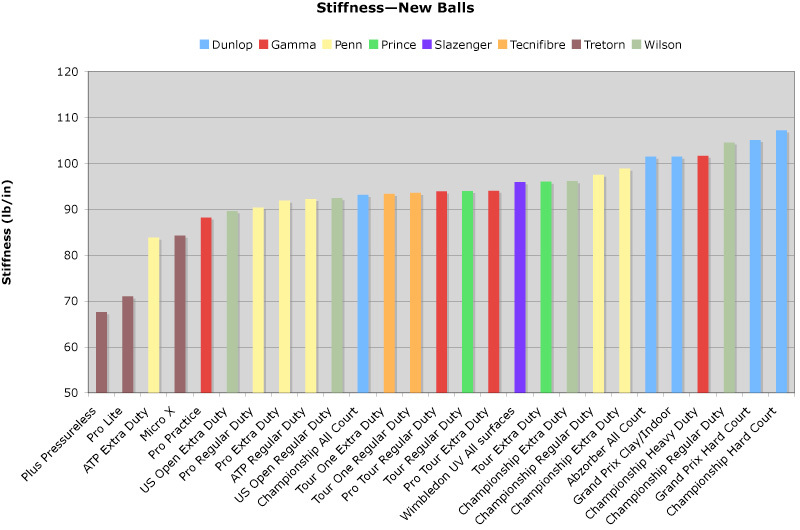 Figure 11 — Stiffness comparison for new balls. Players sometimes complain that balls are either too soft or too hard. The official rules of tennis include specific rules about ball stiffness. A player can test a new or old ball by squeezing it by hand. The test here involved compressing the ball by one inch in a materials testing machine. 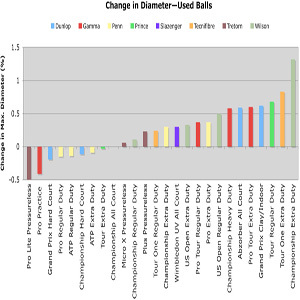 Figure 12 — Stiffness change for used balls. A used ball is generally softer than a new ball since ball stiffness depends on the wall thickness and the amount of air inside the ball. The rubber is about 3 mm thick and the cover is also about 3 mm thick. If the cloth cover wears down to say 2 mm thickness, the ball will become softer. The ball will also become softer if some of the compressed air leaks out (but this doesn't happen with pressureless balls). 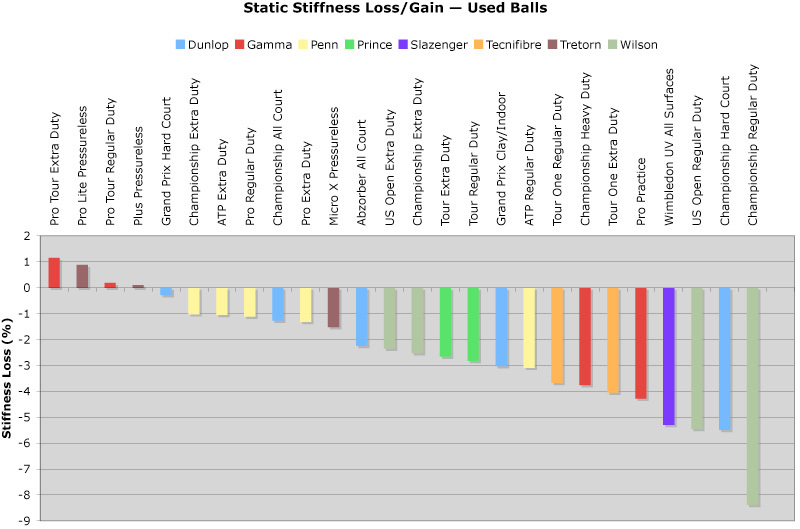 Figure 13 — Stiffness change for used balls sitting for 5 months. After a pressurized ball is removed from its can, air gradually leaks out over time. 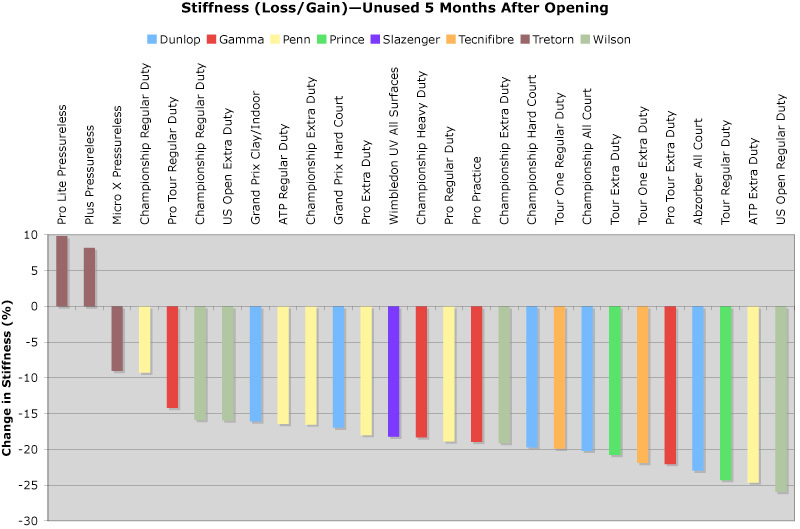 The results here show the resulting decrease in ball stiffness over a 5 month period for balls sitting unused in the can with the lid on. Players can feel this effect simply by squeezing an old ball by hand. Two of the pressureless balls became stiffer over the 5 month period, indicating that the rubber became stiffer with age. This is a well known characteristic of rubber. The change in stiffness over time depends on the type of rubber compound. The rubber in the pressurized balls may also have become stiffer, but the overall stiffness of the ball lessened due to loss of air pressure. As a rule of thumb, a ball felt for your dog to chase in the back yard might be 100 percent unwoven Dacron or acrylic. An inexpensive mass merchandise ball might have a felt that is 15 percent wool, and a performance ball will be woven with about 50- 60 percent wool, with extra duty types having more nylon. So, differences abound. Seemingly, no two tennis balls, like no two fingerprints are the same. No one can actually prove that. So far, all 40 million fingerprints held by the FBI are different, but the next one might well be an identical copy of number 12,583,912. Similarly, no one can prove that all tennis balls are different. So far, all 26 balls we tested were different, but it is possible that we might find two balls one day that are the same.